*In the Northern Hemisphere. For the Southern Hemisphere, switch left and right. It is commonly believed that the left brain hemisphere is analytical and sequential, while the right brain hemisphere is emotional and random. I believe this is all wrong. I hypothesize that the brain is divided by opposites: the left brain hemisphere is for recalling old thoughts and the right brain hemisphere is for creating new thoughts. My hypothesis is based on studies that used fMRI and split-brain patients. Some things in life are known to use just one hemisphere. For instance, many studies have found that most written and spoken language exists in the left hemisphere. Language is one of the few things in life that is consistently recalled. It is old, unchanging, and not being created; no one constantly creates new vocabulary. From my hypothesis, the reason most language exists in the left hemisphere is because it is mostly recalled. Another study found that people tend to use the left hemisphere for tools regardless of the hand holding the tool. For any common tool, such as scissors, one must recall how it is used when using it. No one creates new ways to use the same old tool. I claim that any task that greatly favors the left hemisphere in a study will be a task based on recall instead of creation. I hypothesize that the right hemisphere is for creating new thoughts. Many studies have shown that mental rotation of a non-verbal image is a task performed mostly in the right hemisphere. In a typical mental rotation study, subjects construct a mental image of one stimulus, rotate this image, and judge whether or not this image matches another image. The mentally-rotated image is a newly-created thought – not recalled, which is why the process is performed in the right hemisphere. Studies have also found that puzzle-solving is mostly done in the right hemisphere. To solve a typical puzzle, a person has to come up with a new thought; the solution cannot come from recalling the past. The corpus callosum connects the brain hemispheres. It is used when one hemisphere needs to borrow information from the other hemisphere. This occurs often because the left side of the body is directly connected to the right brain hemisphere, and vice versa. So when the left eye (right hemisphere) sees an object and needs to identify it, the corpus callosum is used to access the left hemisphere. I hypothesize that it is also used to create a new thought based on old (recalled) information, and vice versa. A person with a split brain has had the corpus callosum surgically severed to stop having seizures. For these people, the left side of the body cannot use the left brain hemisphere, and vice versa. In an experiment by Gazzaniga, the picture above was shown to split-brain subjects. When it was shown to only the right eye (left hemisphere), the subjects were able to list the fruits they saw. When it was shown to only the left eye (right hemisphere), the subjects were able to see the face. The conclusion was that the left hemisphere only sees the small picture, while the right hemisphere sees the big picture. My hypothesis is that the left hemisphere is able to recall the names of the fruit because this hemisphere is for recall. 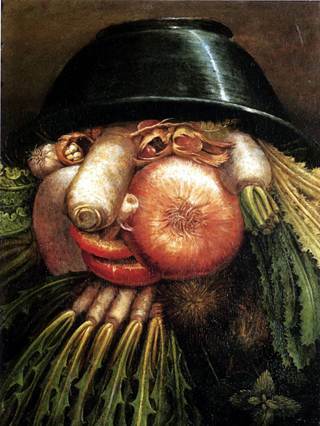 A face composed of fruits is not something the subjects had ever seen before, like the solution to a puzzle. Since the right hemisphere is for creating new thoughts, this hemisphere sees the face. The degree of hemispheric dominance depends on the person. 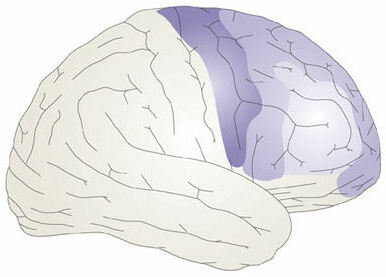 A left-handed person is likely to have a dominant right brain hemisphere. This would mean that information is created more often than recalled. A line represents a (synaptic) connection. A node represents a thought, or piece of information (neuron). The higher the node, the more its information is shared with the other nodes. For example, three lower nodes may represent “dog”, “horse”, and “hamster”, and the higher node that connects these may represent “mammals”. In convergence, many thoughts are simultaneously used to form a resultant thought that is more general or a similarity. So convergence would be thinking of these three animals to create the thought of mammals. Divergence processes information in the opposite direction. 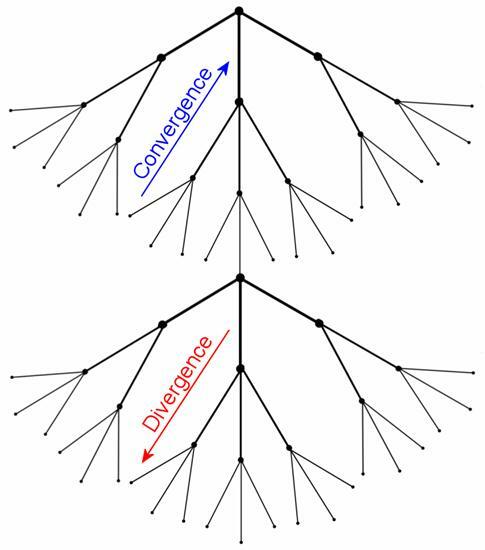 My definition of divergence is expansion, serial processing, contrasting, finding a difference, and descending a hierarchy. In divergence, one thought is used to serially form resultant thoughts that are more specific or differences. So divergence would be thinking of “mammals” to create thoughts of these three animals. Studies show that convergence is used create thoughts in the right frontal lobe. Studies have found that people mainly use the right frontal lobe to make decisions. When making a typical decision, a person must consider many things simultaneously to create a single course of action. This makes decision-making a prime example of convergence. Multitasking, however, is not an example of convergence because it involves completely unrelated thoughts. I believe that as multitasking ability increases, the size of the corpus callosum decreases. 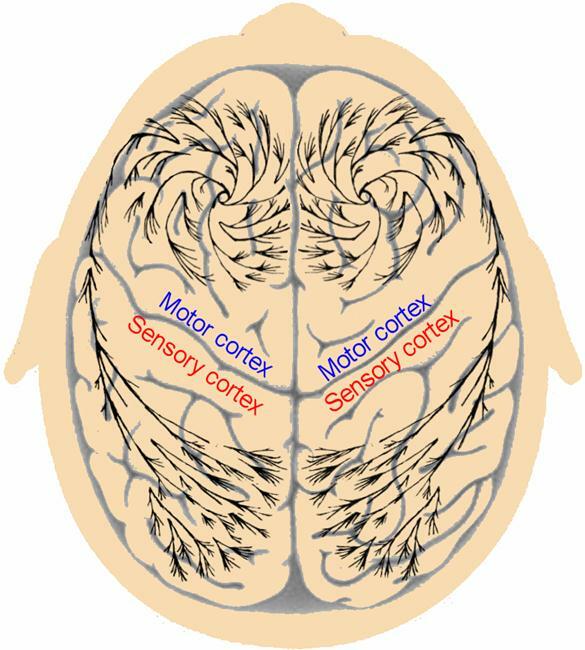 In between the hierarchies are the well-known motor and sensory cortices. These contain simple information that is not processed by convergence or divergence. 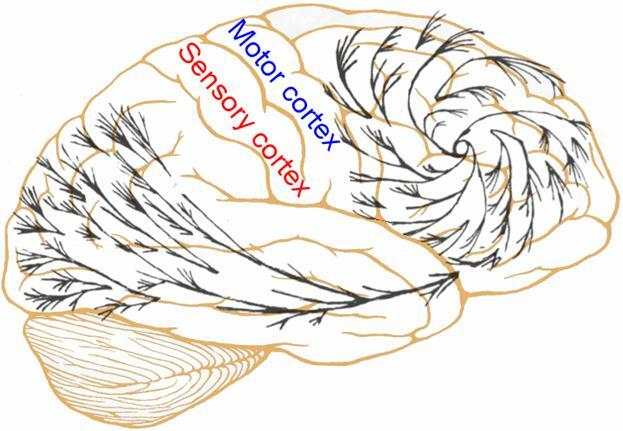 For example, the thought of moving a finger is controlled by the motor cortex. This thought cannot be induced or extracted, which is why it remains separated from the hierarchy. 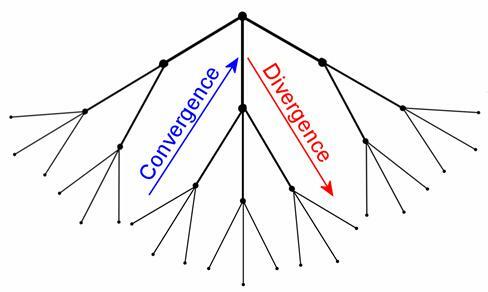 However, there is also motor and sensory information that is related to convergence and divergence. For example, in many sports, the person with the ball must simultaneously consider the position of all the other players to make a good pass. This is convergence and movement. This information exists in the premotor cortex, which is the bottom of the circular hierarchy. Likewise, a relationship exists between sensory information and divergence. A spiral-shaped hierarchy also exists in the left hemisphere. Since the left hemisphere is for recall, the left frontal lobe is for recall of converged information (general thoughts and similarities) and the back of the left hemisphere is for recall of diverged information (specific thoughts and differences). The most general or shared information exists at the center of the circular hierarchy, or frontal lobe. Information that is in between general and specific exists at the perimeter of the circular hierarchy. The most specific information exists at the end of the normal-shaped hierarchy, or occipital lobe. Studies provide evidence for the back of the brain, or occipital lobe, containing the most specific thoughts. The occipital lobe is known as the visual cortex because it is active when things are presented before the eyes. I believe this is a false conclusion. It is based on experiments that always presented things that would be classified as specific, such as a letter or dot. Complex visuals, such as a beach scene, activate other areas of the brain. Scientists probably believe complex visuals include extraneous variables which subjects think about rather than simply look at, thus causing this activation. Complex visuals would be classified as more-general information. According to my hypothesis, this is why it activates other areas of the brain. My hypothesis also says that the occipital lobe is not limited to visual information, but rather contains all specific information. Evidence of this comes from studies of blind people. FMRI shows that the blind use the occipital lobe, especially when it comes to recognizing minor details in sound and touch. In other words, information that is specific relative to the blind. The degree of usage between the frontal lobe and the back of the brain depends on the person and especially the gender. A person with a dominant frontal lobe (convergence) would connect thoughts more often than separate thoughts. This person would have more thoughts that are general than specific. My view of the human brain can be summarized by quadrants. The first quadrant is for creating thoughts via convergence. It contains information that is new, general, and similarities. 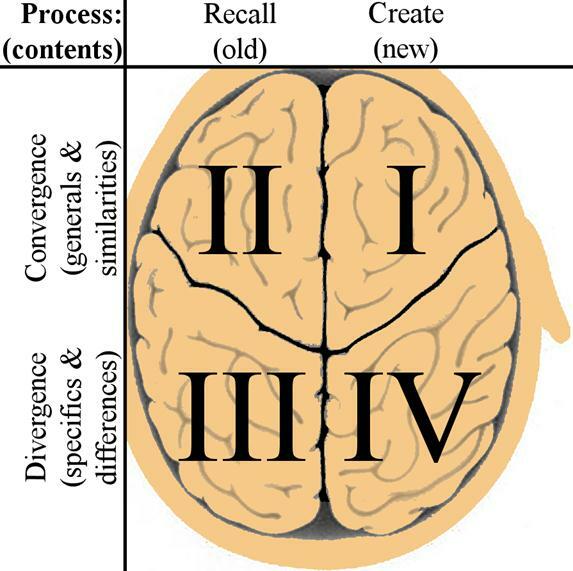 The second quadrant is for recalling converged thoughts. It contains information that is old, general, and similarities. The third quadrant is for recalling diverged thoughts. It contains information that is old, specific, and differences. The fourth quadrant is for creating thoughts via divergence. It contains information that is new, specific, and differences. This is a hypothesis of the cerebrum, which is responsible for higher brain processes and thoughts. Anger, anxiety, fear, pleasure, sadness, etc. do not have specialized areas in the cerebrum. These are emotions that even the simplest animals have. Thus, these are controlled by the primitive parts of the brain, such as the midbrain. This hypothesis is comprehensive: every process or thought can be classified as old or new (left or right hemisphere); every process or thought can be classified as convergence or divergence (front or back of brain). If you are unsure about my hypothesis, please look for any study that maps a process or thought to a certain part of the cerebrum. Categorize that process or thought into one of the quadrants and you will see that the results from the study are congruent with my hypothesis.